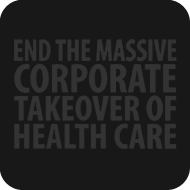 END THE MASSIVE CORPORATE TAKEOVER OF HEALTH CARE. ...but I would have rather seen the Administration sign on to a public option. People forget that the public option was the compromise, and what we really need is a single payer or Medicare For All system. ● Every other industrialized country has universal healthcare. ● The largest nurses group in the US refers to private insurance as "The Real Death Panels" for denying 1 out of every 5 claims, leaving millions uninsured, and ultimately leading to the deaths of over a million Americans. ● Private insurance companies make money by dropping people when they get sick, which means, even if you currently have insurance, you have no assurance that you will have it when you need it. ● The housing crisis and the economy are connected to private insurance, since most foreclosures are due or partially due to healthcare costs. Many people have had to choose between saving a family member or losing their house. ● It's not the public option that's the problem, it's clearly the private option that's upsetting people's lives. ● 44 thousand Americans die each year because they cannot afford healthcare. ● Since Nixon began the health care scam that brings us to where we are today, more than one million Americans have died because they could not afford healthcare. So, this bill is far from perfect. Obama and the democrats lost the opportunity to pass real health care reform, by being too concerned with pleasing private insurance, big pharma, and conservatives (being too bipartisan and too right-wing). Rather than listening to Dennis Kucinich (and his own constituents, the American people), Obama listened to conservatives such as Chuck Grassley, who put the individual mandate to buy insurance in the bill, and then complained about it as if it wasn't his (Grassley's) own idea. Grassley also was one of the biggest promoters of the death panel lie. Obama's a smart man, so why did he waste so much time listening to the hard right? ...only to ruin the bill and lower his poll numbers. The fight for decent healthcare-for-all has just begun, again. I like Obama, but we have to pressure him to listen to the left. If he only gets pressure from the right and support from the left, he'll move further to the right, as we have seen. Let's keep pushing for Medicare For All.